Happy April, peaches! It's Kristin from School and the City. As you know, April is poetry month. What better way is there to celebrate poetry month than by having a poetry slam? I think kids are more motivated to work when they have something to work for, especially when it comes to writing. We all have kids who aren't avid writers, so it's up to us teachers to facilitate a love for writing by giving them a reason to write! Most kids do love poetry units and writing poetry, because poetry in itself is just so much fun. 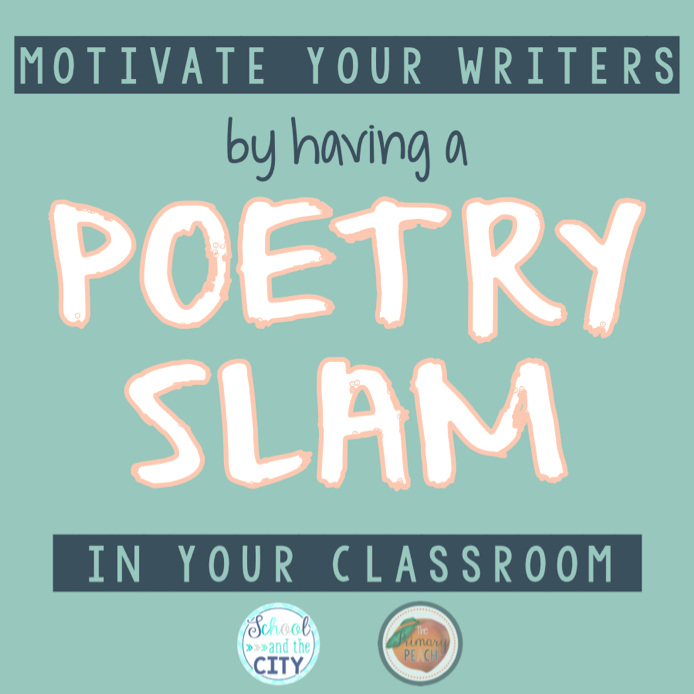 But why not make it more fun, and more motivating for all students, by ending your unit by allowing your students to participate in a poetry slam?! Having poetry slam can be as simple or as complicated as you want it to be; It's totally up to you! Teach the kids how to be good audience members and how to snap. Encourage the students to dress artistically, in all black. Show students videos of people reading / reciting poetry so they can study and mimic verbal and facial expressions. Set the stage! Turn the lights down, gather some lamps, and set the mood. Turn it into a café by providing food or allowing kids to bring snacks. Find a karaoke machine or some sort of sound system to use so everyone can hear. CLICK the picture to check out my editable invitations! Last year, my students worked extremely hard all month creating poetry books using my templates and adding their own pages. They turned out to be great little poets! I can't wait to see how my class does this year. What do you think? Will you host a poetry slam for your students? Let me know over at School and the City if you try it! Have a great April in your classroom... and stay tuned for more April ideas!